Are you preparing for a first aid or CPR exam/test? Here’s some common exam questions and answers to help you prepare for your upcoming exam! How many beats per minute should the speed of the chest compressions be? Chest compressions should be performed at a speed of 100 – 120 chest compressions per minute. This means the maximum speed should be 2 chest compressions a second. How long should you check a victim to see if they are breathing normally? 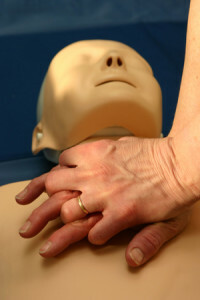 You should spend a maximum of 10 seconds checking a victim for normal breathing. If you do not find normal breathing within 10 seconds then commence CPR. Do not spend longer than 10 seconds checking for breathing as this will delay lifesaving resuscitation. If a casualty is choking and is unable to cough how is this described? If a casualty is choking and unable to cough then this is a sign of complete airway obstruction and required urgent first aid intervention. You should perform back blows and abdominal thrusts (sometimes called the Heimlich manoeuvre) to attempt to dislodge the object. If a person is suffering from anaphylaxis they need to receive what urgently? The victim should receive Adrenaline / Epinephrine (same drug, different name) urgently as soon as an anaphylactic reaction is suspected. What is the first thing you should do if a person is unconscious and not breathing? Your first step if a person is unconscious and not breathing should be to call an ambulance / emergency medical help. Do not delay in calling for help! What is the correct ratio for chest compressions to rescue breaths? The correct ratio is thirty chest compressions to two rescue breaths (30:2). What should you do if you find a breathing but unconscious person? An unconscious person who is breathing should be turned onto their side into the recovery position. This will protect their airway and could save their life. Want to learn more first aid skills? Sign up to one of our free online training classes to develop your first aid skills and knowledge.